Late last year when this exhibit was announced, it was almost as if there was a collective sigh among video game nerds to the tune of, “FINALLY. Validation.” Their hobby of choice that had taken up so much of their time would be recognized for the contributions it had made to culture and society. Or something like that. 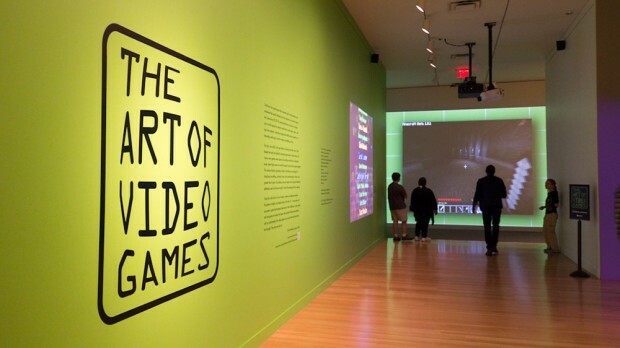 Last week the Art of Video Games opened to the public. Did it turn out to be as awesome as we had hoped? Walking forward towards the exhibit one is greeted by a wall displaying video from the various games within. You see quick shots of Metal Gear Solid, Minecraft, Zelda. You become excited for what you are about to see. It’s video games! In a museum, you guys! The first room of the exhibit has a wall of concept images taken from various stages of conception. Some images are sketches of characters or maps, while others full color productions. Five monitors display the increasing complexity of game mechanics throughout the generations. There are interviews with designers on another wall, as well. Into the next room you are greeted with several playable demos of key games throughout the last thirty years. Classics like Pacman and Super Mario Brothers are mixed with more interesting choices like The Secret of Monkey Island and Myst. “Interesting” not because they don’t deserve to be featured, but because they are rather odd to pick up and play quickly. The room filled with hoots and hollers during particular close calls and deaths of Mario or Pacman. While I have seen and played all of the games on display, I like the idea of a grandmother or other person unfamiliar with games to be able to see and put their hands on titles beyond what they might know tangentially by osmosis (i.e. Mario and Pacman). The third and final room on display feature kiosks holding one of each of the major consoles of the past thirty years. The kiosks all had four games on display (that were voted on by the public) and a monitor that played video of the games with information on how those games affected their respective genres in that generation. Unfortunately for my nerd desires, the exhibit was a little smaller than I had been expecting, but that is probably only because I wanted it to be huge beyond what would be reasonable. I wanted so many video game things! A notable exception from what was on display was any discussion of music in games. Again, space was probably an issue, and they might have simply wanted to focus on the visual considering it is the American Art Museum, but there definitely is emotion lost when playing games on mute. If we are going to say that a game is art, as a whole that would have to include the music as well. It is interesting to view an art exhibit that I actually have quite a bit of knowledge about. Things that were discussed were, to me, pointed more towards the “layman,” which makes sense. I am sure that someone who has studied art may see a placard describing the significance of the columns in The Oath of the Horatii, for example, and think, “Yeah, I get that. That’s easy to see.” That’s the feeling I felt when a video discussed how the SNES could provide more expressive characters for their games from previous consoles. Yep, I know. But for grandma, this is all new information, and hopefully she will walk away with more respect and understanding for the hobby little Billy seems so wrapped up in. All told, I had a very fun afternoon looking at what I can now say for certain is art. Sorry, Ebert, but it’s been confirmed. No, they have SOME variety, but there definitely were more Nintendo staples represented for each Nintendo console than from other developers. And it kind of makes sense considering Nintendo makes games for so many genres.